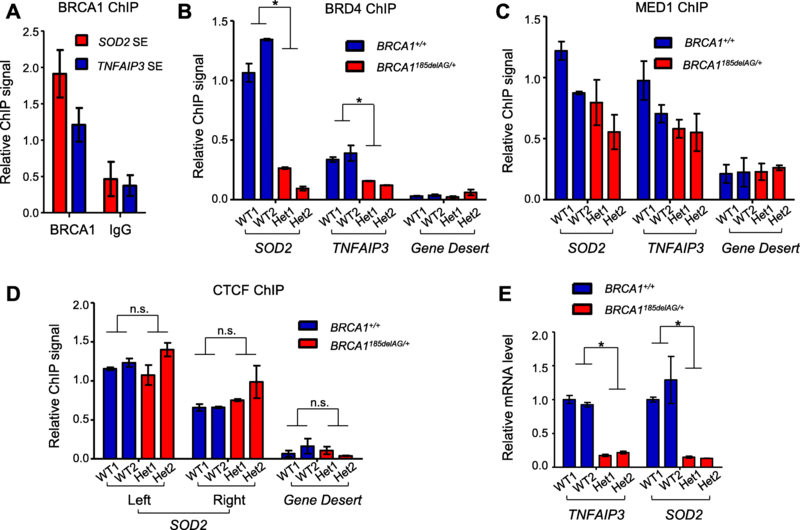 BRCA1-associated breast cancer originates from luminal progenitor cells. BRCA1 functions in multiple biological processes, including double-strand break repair, replication stress suppression, transcriptional regulation, and chromatin reorganization. While non-malignant cells carrying cancer-predisposing BRCA1 mutations exhibit increased genomic instability, it remains unclear whether BRCA1 haploinsufficiency affects transcription and chromatin dynamics in breast epithelial cells. H3K27ac-associated super-enhancers were compared in primary breast epithelial cells from BRCA1 mutation carriers (BRCA1mut/+) and non-carriers (BRCA1+/+). Non-tumorigenic MCF10A breast epithelial cells with engineered BRCA1 haploinsufficiency were used to confirm the H3K27ac changes. The impact of BRCA1 mutations on enhancer function and enhancer-promoter looping was assessed in MCF10A cells. Here, we show that primary mammary epithelial cells from women with BRCA1 mutations display significant loss of H3K27ac-associated super-enhancers. These BRCA1-dependent super-enhancers are enriched with binding motifs for the GATA family. Non-tumorigenic BRCA1mut/+ MCF10A cells recapitulate the H3K27ac loss. Attenuated histone mark and enhancer activity in these BRCA1mut/+ MCF10A cells can be partially restored with wild-type BRCA1. Furthermore, chromatin conformation analysis demonstrates impaired enhancer-promoter looping in BRCA1mut/+ MCF10A cells. H3K27ac-associated super-enhancer loss is a previously unappreciated functional deficiency in ostensibly normal BRCA1 mutation-carrying breast epithelium. Our findings offer new mechanistic insights into BRCA1 mutation-associated transcriptional and epigenetic abnormality in breast epithelial cells and tissue/cell lineage-specific tumorigenesis. The online version of this article ( https://doi.org/10.1186/s13058-019-1132-1) contains supplementary material, which is available to authorized users. Approximately 1 in 400 women in the USA carry germ-line BRCA1 mutation (BRCA1mut/+) [1, 2]. 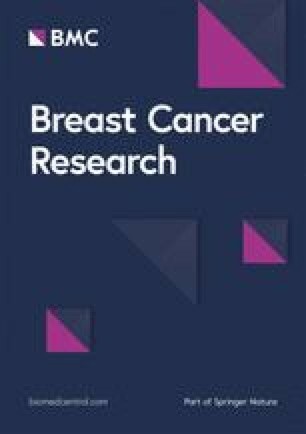 These BRCA1 mutation carriers have significantly higher risk of developing breast cancer compared to the general population, with an estimated cumulative risk of 65% by the age of 70 [3, 4]. While breast cancer screening could assist diagnosis at an early stage, it alone cannot reduce cancer risk . The only effective risk-reducing options for women with BRCA1 mutations are prophylactic mastectomy and oophorectomy, which can achieve 90% and 50% reduction in breast cancer risk, respectively [6, 7, 8, 9]. However, due to the adverse physical and psychological effects, many at-risk women opt not to undergo these surgeries [10, 11]. Understanding functional deficiency that occurs prior to clinically evident cancer in precancerous BRCA1mut/+ breast epithelium is an important step towards developing alternative preventive strategies with higher precision and fewer side effects. Mammary gland epithelium is composed of two lineages: luminal cells that surround the central lumen, and basal cells that are located adjacent to mammary stroma . BRCA1 haploinsufficiency leads to a luminal progenitor population deficiency in luminal cell differentiation [13, 14, 15, 16]. Most BRCA1-associated breast tumors have a basal-like phenotype, with positive staining for the basal cell markers cytokeratin 5/6/14/17 and negative staining for the luminal cell markers estrogen receptor (ER) and progesterone receptor (PR) [17, 18, 19, 20]. Of note, the basal breast cancer subtype is associated with poor clinical outcome . However, BRCA1-associated basal-like breast tumors originate from luminal progenitor cells, namely, the cell of origin for BRCA1-associated tumors [13, 14, 16]. A major gap of knowledge in BRCA1-related cancer biology concerns the mechanism by which a single copy of BRCA1 mutant allele leads to luminal differentiation deficiency and eventually basal-like tumors. BRCA1 is best known for maintenance of genomic integrity through its functions in repair of double-strand DNA breaks via homologous recombination (HR) [22, 23, 24], regulation of cell cycle checkpoints [25, 26], and suppression of DNA replication stress . When compared with their BRCA1+/+ counterparts, BRCA1mut/+ mammary epithelial cells function comparably in checkpoint regulation, yet exhibit haploinsufficiency in replication stress suppression and DNA repair [27, 28, 29, 30, 31]. While maintenance of genomic integrity is essential to BRCA1 tumor suppressor function, it alone does not easily explain the cell lineage-specific deficiency that occurs at early stages of tumorigenesis in BRCA1 mutation carriers. BRCA1 is also implicated in transcriptional regulation and high-order chromatin reorganization [25, 32, 33, 34, 35, 36, 37], processes that primarily dictate normal tissue development and cell differentiation. In support of this notion, multiple genome-wide studies show that BRCA1 preferentially binds to transcription start sites (TSSs) [38, 39]. Furthermore, our recent mouse genetic studies provide evidence for a functional crosstalk between BRCA1 and a bona fide transcription factor that regulates mammary luminal progenitor cell expansion and BRCA1-associated tumorigenesis [15, 40]. However, it remains unclear whether BRCA1mut/+ breast epithelial cells are haploinsufficient in regulation of transcription and chromatin dynamics. Acetylated histones destabilize nucleosomes, increase chromatin accessibility for transcription factor binding, and ultimately facilitate gene expression [41, 42]. In particular, histone lysine 27 acetylation (H3K27ac) serves as a surrogate mark for active transcriptional enhancers . Super-enhancers, which are large clusters of transcriptional enhancers, are bound by high levels of master regulatory transcription factors and co-factors [44, 45]. A high concentration of transcription factor binding renders rapid response of the corresponding target genes to various developmental cues [44, 46]. Super-enhancers, which are highly cell-type specific and enriched for H3K27ac, drive expression of genes that have essential roles in cell fate determination . Notably, dysfunctional super-enhancers have been causally linked to pathogenesis including cancer [44, 45, 47, 48, 49, 50, 51, 52]. Of note, BRCA1 interacts with CREB-binding protein (CBP) and p300, two structurally related histone acetyltransferases (HAT) that acetylate histones including H3K27 . In addition, BRCA1 is found to interact with components of the histone deacetylase complex (HDAC) . However, a potential role of BRCA1 in regulation of super-enhancer functions has not been investigated. Here, we conducted whole-genome H3K27ac profiling of primary breast epithelial cells from BRCA1 mutation carriers (BRCA1mut/+) and non-carriers (BRCA1+/+). Bioinformatics analysis indicates that heterozygous cancer-predisposing BRCA1 mutation (BRCA1mut/+) dampens super-enhancer marks in primary human mammary epithelial cells (HMECs), in particular at those super-enhancers with GATA transcription factor binding. The effect of BRCA1 mutations on super-enhancers was further corroborated using established non-tumorigenic breast epithelial cells engineered with a single copy of BRCA1 mutant allele (BRCA1mut/+). Mechanistically, reduced H3K27ac levels in BRCA1mut/+ cells lead to impaired enhancer-promoter looping and decreased enhancer activity. Our work uncovers a previously unappreciated function of BRCA1 in super-enhancer regulation. 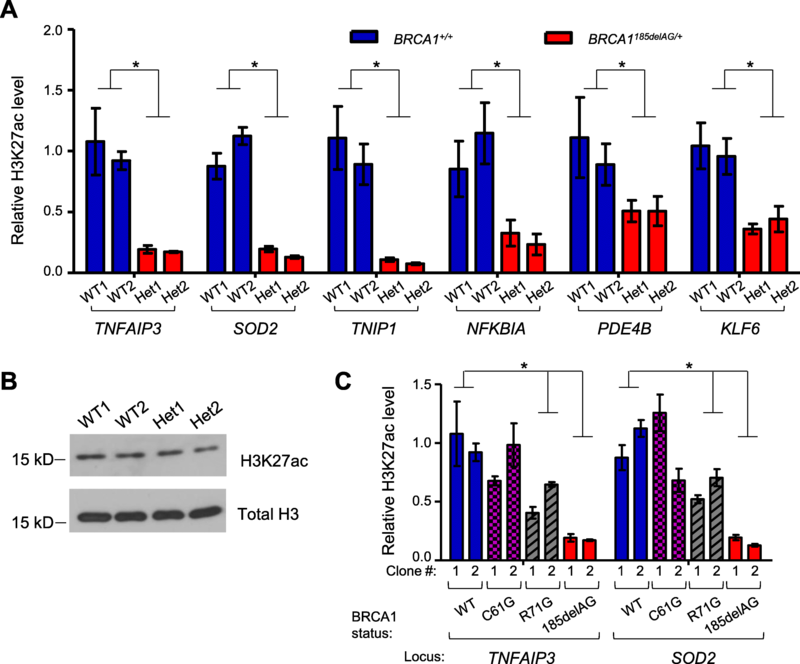 The functional haploinsufficiency likely contributes to the cell lineage switch observed in early stages of BRCA1-associated breast tumorigenesis. Cancer-free breast tissues were procured from women either undergoing cosmetic reduction mammoplasty or prophylactic mastectomy, following protocols approved by the Institutional Review Board at the University of Texas Health Science Center at San Antonio. All donors signed written consent forms authorizing the use of the specimens. Fresh human breast tissue was processed as previously described . In brief, tissue was digested in digestion buffer (DMEM/F-12 supplemented with 5% FBS, 0.1% BSA, 10 ng/mL epidermal growth factor, 10 ng/mL cholera toxin, 5 μg/mL insulin, 0.5 mg/mL hydrocortisone, 300 U/mL collagenase, and 100 U/mL hyaluronidase) on a 37 °C shaker overnight. Epithelium-enriched population was collected by centrifugation at 100 g for 3 min. Pellet was treated with 0.8% ammonium chloride to lyse red blood cells, followed by digestion with 0.05% trypsin-EDTA at 37 °C for 3 min. Cells were washed with washing buffer (HBSS supplemented with 2% FBS) and treated with dispase buffer (5 mg/mL dispase supplemented with 0.1 mg/mL DNase I) at 37 °C for 3 min. Single cells were obtained by passing through a 40-μm strainer. For H3K27ac/BRD4/CTCF ChIP, single cells were crosslinked with 1% formaldehyde at room temperature for 10 min, followed by incubation with 125 mM glycine for an additional 5 min. For MED1/BRCA1 ChIP, cells were crosslinked with 2 mM of disuccinimidyl glutarate (Thermo Fisher Scientific; 20593) at room temperature for 45 min, followed by further crosslinking with formaldehyde as described above. All following steps were carried out in buffers containing protease inhibitors in 4 °C until elution. Cells were pelleted by centrifugation at 1000g for 5 min, washed with PBS twice, then lysed in lysis buffer (5 mM HEPES, pH 7.9, 85 mM KCl, 0.5% Triton X-100) for 10 min. Nuclei were pelleted by centrifugation at 1600 g for 5 min and lysed in nuclei lysis buffer (50 mM Tris-HCl, pH 8.0, 10 mM EDTA, 1% SDS). Chromosomal DNA was sonicated using a Bioruptor Pico to obtain < 300-bp fragments. Ten percent of sonicated DNA was saved as input, and the rest was incubated with various antibodies overnight (H3K27ac: Abcam; ab4729. BRD4: Abcam; ab128874. CTCF: MilliporeSigma; 07-729. MED1: Bethyl Laboratories, Inc.; A300-793A. BRCA1: Bethyl Laboratories, Inc.; A300-000A). Dynabeads Protein A or G (Thermo Fisher Scientific; 10002D or 10003D) was added the following day and incubated for additional 4 h before washing. Washing was performed twice in TE sarcosyl buffer (50 mM Tris-HCl, pH 8.0, 2 mM EDTA, 0.2% sarcosyl), twice in TSE1 buffer (150 mM sodium chloride, 20 mM Tris-HCl pH 8.0, 2 mM EDTA, 0.1% SDS, 1% Triton X-100), twice in TSE2 buffer (500 mM sodium chloride, 20 mM Tris-HCl, pH 8.0, 2 mM EDTA, 0.1% SDS, 0.1% Triton X-100), twice in TSE3 buffer (250 mM lithium chloride, 10 mM Tris-HCl, pH 8.0, 1 mM EDTA, 1% sodium deoxycholate, 1% NP-40), and twice in TE buffer (50 mM Tris-HCl, pH 8.0, 2 mM EDTA). DNA was subsequently eluted from Dynabeads, reverse-crosslinked, and ethanol-precipitated. Locus-specific ChIP was assessed by PCR using primers as shown in Additional file 1: Table S2. For BRD4-H3K27ac ChIP-re-ChIP, samples were processed as described above prior to washing. BRD4-DNA-bound beads were washed three times in re-ChIP washing buffer (2 mM EDTA, 500 mM NaCl, 0.1% SDS, 1% NP40) and twice in TE buffer (50 mM Tris-HCl, pH 8.0, 2 mM EDTA). Samples were eluted in re-ChIP elution buffer (2% SDS, 15 mM DTT in TE buffer) by incubation at 37 °C for 30 min. After diluting 20 times with dilution buffer (16.7 mM Tris-HCl, pH 8.0, 0.01% SDS, 1% Triton X-100, 1.2 mM EDTA, 167 mM NaCl, 50 μg of BSA), samples were incubated with the re-ChIP antibody overnight, then processed as ChIP samples using the method described above. H3K27ac chromatin immunoprecipitation with deep sequencing (ChIP-seq) libraries were constructed using a MicroPlex Library Preparation Kit (Diagenode; C05010011) following the manufacturer’s guide. After a total of 10 cycles of PCR amplification, libraries were purified using Agencourt AMPure XP System (Beckman Coulter; A63880). Quality and quantity of the libraries were measured by a Qubit dsDNA HS Assay Kit (Life Technologies; Q32851) using a Bioanalyser 2100. Libraries with different index sequences were pooled together and then sequenced with a single-end 50-bp module using an Illumina Hiseq 3000 system. De-multiplexing was performed by CASAVA to generate FASTQ files for each sample. Between 38 and 92 million unique mapped reads were obtained for each sample. H3K27ac ChIP-seq was aligned to the human genome by BWA , and only unique mapped reads were saved. BELT , a bin-based peak calling algorism that applies a statistical method to control false discovery rate (FDR), was used to call peaks. Super-enhancers were identified using ROSE [45, 46]. Briefly, H3K27ac ChIP-seq peaks within 12.5 kb of one another were stitched together as enhancer clusters, then ranked and plotted based on the H3K27ac ChIP-seq signal. Stitched enhancer clusters that pass the inflection point in the distribution were designated as super-enhancers. HOMER  program was used for prediction of transcription factor binding sites. H3K27ac peaks located within super-enhancers were pooled together for motif search. Each super-enhancer was assigned a gene name based on closest proximity. ToppGene was used for Gene Ontology analysis . MCF10A with wild-type BRCA1 or heterozygous BRCA1 mutations were previously reported [29, 30] and cultured in DMEM/F12 (Thermo Fisher Scientific; 11330) supplemented with 5% of horse serum (Thermo Fisher Scientific; 16050), 20 ng/mL EGF (Gibco; PHG0311), 0.5 mg/mL hydrocortisone (Sigma; H0888), 100 ng/mL cholera toxin (Sigma; C8052), 10 μg/mL insulin (Sigma, I1882), and 1× penicillin-streptomycin (Thermo Fisher Scientific; 15070). Two days prior to the experiments, cells were trypsinized and 1.2 million cells were seeded in each 10-cm dish (MilliporeSigma; CLS3262). 3C was performed following an established protocol with minor changes [57, 58]. In brief, MCF10A cells were trypsinized and counted. Ten million cells were used for each 3C condition. Cells were crosslinked with 1% formaldehyde at room temperature for 10 min, followed by 125 mM glycine at room temperature for 5 min. Cells were pelleted by centrifugation at 600 g at 4 °C for 5 min and re-suspended in pre-chilled lysis buffer (10 mM Tris-HCl, pH 8.0, 10 mM NaCl, 0.2% NP-40, 1 μg/mL leupeptin, 1 μg/mL aprotinin, 1 μg/mL pepstatin, and 1 mM PMSF). Samples were incubated on ice for 15 min and passed through a 21-G needle five times. Nuclei were pelleted by centrifugation at 2200g at 4 °C for 5 min, washed twice with NEB buffer 2.1, and re-suspended in NEB buffer 2.1. SDS was added to nuclei at a final concentration of 0.1%. Samples were incubated on a 65 °C shaker for 10 min then on ice immediately. Triton X-100 was added to quench SDS at a final concentration of 1%. Samples were incubated with 400 U of HindIII (New England Biolabs; R3104L) at 37 °C with rotation overnight. SDS was added to the samples the following day at a final concentration of 1.6%. Samples were incubated on a 65 °C shaker for 30 min and then transferred into 15-mL tubes with pre-chilled ligation buffer (1% Triton X-100, 0.8 mg BSA, 50 mM Tris-HCl, pH 8.0, 10 mM MgCl2, 10 mM DTT, and 2 mM ATP). After incubation with 300 U of T4 DNA ligase (Thermo Fisher Scientific; EL0011) at 16 °C for 4 h, samples were treated with 0.5 mg of proteinase K at 65 °C for 4 h, followed by an additional 0.5 mg of proteinase K treatment at 65 °C overnight. DNA was phenol-chloroform extracted the following day, diluted with distilled water, and ethanol-precipitated. Samples were treated with RNase A at 37 °C for 2 h, followed by phenol-chloroform extraction and ethanol precipitation. DNA was dissolved in TE at 4 °C overnight. Serially diluted 3C products were analyzed by PCR to determine linear range. 3C libraries within the linear range were analyzed by PCR using primers specific for the restriction fragments of interest. GAPDH was used for loading normalization. 3C primers are listed in the Additional file 1: Table S2. To compare super-enhancer landscapes in BRCA1+/+ and BRCA1mut/+ normal human breast epithelia, primary HMECs were isolated from fresh cancer-free breast tissues of BRCA1 mutation carriers (BRCA1mut/+, n = 3) and non-carriers (BRCA1+/+, n = 3), who underwent prophylactic mastectomy and reduction mammoplasty, respectively. H3K27ac chromatin immunoprecipitation with deep sequencing (ChIP-seq) was performed [45, 59] (Fig. 1a), and super-enhancers were identified in each sample using established bioinformatics tool ROSE [45, 46]. A total of 343 super-enhancers were identified in BRCA1mut/+ and/or BRCA1+/+ breast epithelia, 268 of which were shared by BRCA1+/+ and BRCA1mut/+ HMECs (Additional file 2: Table S1, for an example see Additional file 3: Figure S1). H3K27ac intensity for 72 super-enhancers was lost or substantially attenuated in BRCA1mut/+ HMECs (Fig. 1b). Three representatives of such loci are shown in Fig. 1c, and the differential signals between BRCA1+/+ and BRCA1mut/+ were confirmed by locus-specific ChIP-qPCR (Fig. 1d). In contrast to the relatively large number of super-enhancers lost in BRCA1 mutation carriers, only 3 super-enhancers were gained in the mutation-carrying samples (Fig. 1b, Additional file 2: Table S1). 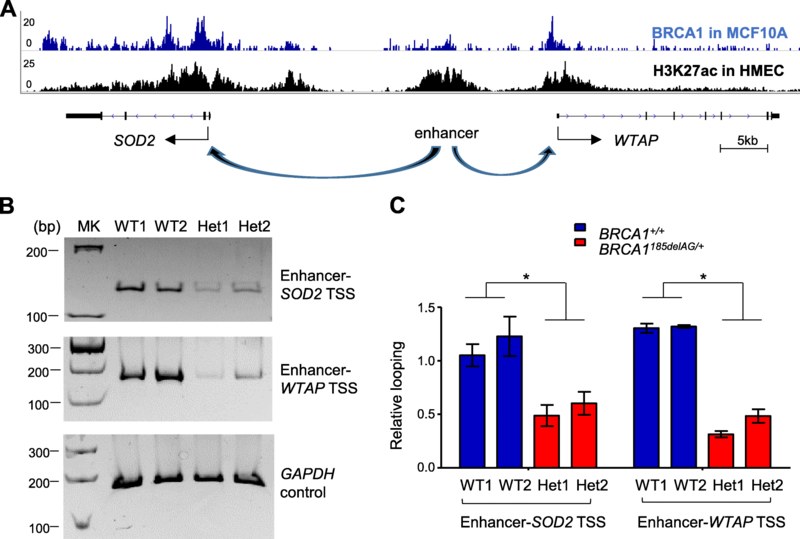 This result suggests a predominant role of wild-type (WT) BRCA1 in sustaining histone marks for super-enhancers in normal HMECs. To discern common features shared by those super-enhancers attenuated in BRCA1mut/+ HMECs, we used HOMER software suite  to identify transcription factor binding motifs that are enriched in these super-enhancers. We found that binding motifs for the GATA transcription factor family (GATA2, GATA3, and GATA4) are overrepresented in this group of super-enhancers (Fig. 2a). Using publicly available ENCODE ChIP-seq data performed in ER+ luminal breast cancer T47D cells , we found that 49 of the 72 super-enhancers missing in BRCA1mut/+ HMECs have GATA3-binding peaks. Given the well-established role of GATA3 in breast luminal epithelial fate determination [60, 61, 62], the reduced number of GATA-enriched super-enhancers could account for deficiency in luminal cell differentiation previously reported for BRCA1mut/+ HMECs [13, 14, 15, 16]. We also used an established method to assign these super-enhancers to a total of 160 proximal potential target genes [44, 45, 63]. Gene ontology analyses show that this group of genes is enriched with those involved in various stress responses, including oxygen-containing compound, inflammation, and external stimulus (Fig. 2b). In summary, our genome-wide work of clinical samples indicates that BRCA1 haploinsufficiency is associated with attenuated super-enhancers that have potential roles in lineage differentiation of human mammary epithelial cells. To corroborate the findings from primary HMECs, we used MCF10A cells that were genetically engineered to harbor a single allele of cancer-causing BRCA1 mutation [29, 30]. MCF10A represents an immortalized yet non-tumorigenic human breast epithelial cell line with near normal diploidy. When cultured with extracellular matrix, MCF10A cells form acinar structures that recapitulate many aspects of mammary architecture in vivo [64, 65]. Previously published work has shown that BRCA1mut/+ MCF10A cells are prone to genomic instability, thus mimicking HMECs of BRCA1 mutation carriers [29, 30]. We first examined H3K27ac marks in MCF10A clones carrying the most common pathogenic BRCA1 mutation, 185delAG [30, 66]. To control for clonal variations, two independently targeted BRCA1185delAG/+ (Het1 and Het2, Fig. 3a) and two wild-type (WT1 and WT2) control MCF10A clones (BRCA1+/+, Fig. 3a) were evaluated by locus-specific H3K27ac ChIP. Six representative super-enhancers attenuated in primary BRCA1mut/+ HMECs were chosen for studies in the MCF10A-derived clones, each of which is named after the corresponding putative target genes. Similar to BRCA1mut/+ HMECs, both BRCA1185delAG/+ MCF10A clones had dramatically decreased H3K27ac levels compared to their WT counterparts (Fig. 3a). Of note, there was no significant difference in global H3K27ac levels between BRCA1185delAG/+ and WT cells (Fig. 3b and Additional file 3: Figure S2), suggesting that reduced H3K27ac signals in BRCA1 mutant cells are likely due to BRCA1-dependent locus-specific changes in super-enhancer mark. We also assessed super-enhancer-associated H3K27ac status in MCF10A cells carrying a copy of two other common deleterious heterozygous BRCA1 mutations [67, 68]. BRCA1R71G/+ clones exhibited significant reduction in H3K27ac intensity at two super-enhancers (TNFAIP3 and SOD2) compared to WT clones (Fig. 3c), whereas BRCA1C61G/+ clones showed no appreciable H3K27ac changes (Fig. 3c). Taken together, BRCA1 haploinsufficiency in both HMECs and established breast epithelial cells is associated with attenuated super-enhancer mark. However, severity of the deleterious effect likely depends on locations of the BRCA1 cancer-predisposing mutations. To gain more mechanistic insights into heterozygous BRCA1 mutation-associated super-enhancer dysfunction, we used two representative super-enhancer loci TNFAIP3 and SOD2 because both promoters are associated with BRCA1 in various human cell lines as shown by publicly available BRCA1 ChIP-seq datasets [38, 39] (Additional file 3: Figure S3A and B). We first confirmed BRCA1 chromatin association with these two loci by ChIP in MCF10A cells (Fig. 4a). Next, we determined whether BRCA1185delAG/+ mutation status affects chromatin binding of bromodomain-containing protein 4 (BRD4), an epigenetic reader that binds to acetylated histone tails in active enhancer regions [69, 70, 71]. We observed a dramatic decrease in BRD4 chromatin binding at TNFAIP3 and SOD2 super-enhancers in BRCA1185delAG/+ MCF10A clones versus their WT counterparts (Fig. 4b). Of note, there was no significant difference in global BRD4 protein levels between BRCA1185delAG/+ and WT cells (Additional file 3: Figure S4). To directly test if BRD4 and H3K27ac are simultaneously associated with the same chromatin region, we performed BRD4-H3K27ac ChIP-re-ChIP. We found that BRD4 and H3K27ac co-occupy TNFAIP3 and SOD2 super-enhancers, and such co-occupancy was significantly decreased in BRCA1185delAG/+ cells compared to their WT counterparts (Additional file 3: Figure S5). These data strongly suggest that reduced H3K27ac level in BRCA1 haploinsufficient cells directly attenuates epigenetic reading. We also sought to determine whether BRCA1 haploinsufficiency affects chromatin association of other enhancer-binding proteins at the aforementioned loci. MED1 is a subunit of the transcription coactivator Mediator complex that serves as a bridge to physically connect enhancers with their corresponding promoters and to transduce signals from various transcription factors to RNA polymerase II . MED1 chromatin binding at the BRCA1 mutation-affected super-enhancers showed a trend of decrease, albeit statistically insignificant, in BRCA1185delAG/+ MCF10A clones versus the WT control (Fig. 4c). We also assessed chromatin binding of CCCTC-binding factor (CTCF), which acts to shield undesired interactions between enhancers and promoters [73, 74]. Consistent with public datasets that indicate two CTCF binding peaks at the SOD2 super-enhancer (Additional file 3: Figure S3A), we found that CTCF ChIP signals at these sites have similar intensity in WT control and BRCA1185delAG/+cells (Fig. 4d). Global CTCF levels were also similar in WT and mutant clones (Additional file 3: Figure S6). In accordance with reduced H3K27ac and BRD4 binding at these two super-enhancer loci, mRNA levels of TNFAIP3 and SOD2 were significantly diminished in BRCA1185delAG/+ MCF10A clones (Fig. 4e). Taken together, our data clearly suggest that haploinsufficient BRCA1 mutation selectively impairs chromatin binding of enhancer-binding proteins and transcription of their downstream target genes. BRCA1 185delAG contains a 2-nucleotide deletion in the second exon, leading to a frame shift and pre-mature translation termination immediately after the deletion. Indeed, BRCA1185delAG/+ MCF10A clones have lower WT BRCA1 level (Additional file 3: Figure S7). To ascertain that reduced H3K27ac intensity at various super-enhancers is indeed causally linked to lower WT BRCA1 expression in haploinsufficient cells, we ectopically expressed WT BRCA1 in WT and mutant MCF10A cells. BRCA1 overexpression did not change H3K27ac mark at TNFAIP3 and SOD2 super-enhancers in WT MCF10A clones, but substantially elevated H3K27ac levels at these two super-enhancer loci in BRCA1185delAG/+ clones (Fig. 5a, b). Concomitantly, mRNA levels of TNFAIP3 and SOD2 in mutant cells were also increased upon ectopic BRCA1 expression (Fig. 5c, d). These data strongly indicate that BRCA1 haploinsufficiency directly influences H3K27ac intensity at these super-enhancers and their functionality in transcriptional activation. An important mechanism in transcriptional regulation in higher eukaryotes involves looping between distal enhancers and the corresponding proximal promoters [75, 76, 77]. To determine the impact of BRCA1 haploinsufficiency on enhancer-promoter interactions, we carried out chromosome conformation capture (3C), the gold standard assay for examining long-distance chromatin looping [57, 78]. MCF10A cells were crosslinked to capture chromatin interactions, and restriction-digested DNA was ligated at a very low concentration that favors proximity ligation [57, 78]. We focused on the enhancer region that has the strongest H3K27ac signal in the SOD2-associated super-enhancer and interrogated its interactions with TSSs of two immediate flanking genes SOD2 and WTAP (Fig. 6a). 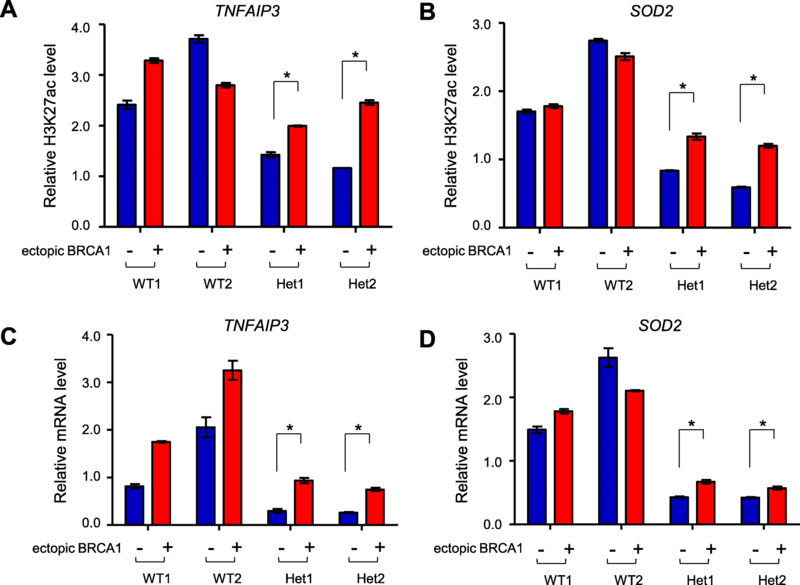 Compared to their WT counterparts, the two BRCA1 mutant cell lines showed significantly decreased looping incidence between the enhancer and two flanking promoters (Fig. 6b, c). We conclude from these experiments that BRCA1 haploinsufficiency affects long-distance chromatin interactions between transcription enhancers and promoters. Combining studies of clinical samples and gene editing-generated isogenic cell lines, our work clearly demonstrates that a single copy of cancer-predisposing BRCA1 mutation reduces super-enhancer mark and enhancer function in transcriptional activation. The causality of BRCA1 haploinsufficiency and super-enhancer dysfunction is corroborated by partial rescuing of the phenotype with ectopic wild-type BRCA1. Collectively, our findings lend support to the notion that heterozygous BRCA1 mutations are haploinsufficient for transcriptional regulation in non-tumorigenic breast epithelial cells prior to clinically evident cancer appearance. BRCA1-associated breast tumors originate from luminal progenitor cells, yet they eventually become basal-like [13, 14, 16]. Deficient luminal cell maturation represents one of the earliest hallmarks of BRCA1 mutation-carrying breast epithelium [14, 15]. Our data indicate that super-enhancers that are preferentially lost in BRCA1mut/+ HMECs are significantly enriched for GATA binding sites. Among the members of the evolutionally conserved GATA transcription factor family , GATA3 is known for its critical role in regulating luminal cell fate in the mammary gland [60, 61]. Notably, genetic ablation of mouse Gata3 causes expansion of luminal progenitor cells and deficiency in luminal differentiation, which bears striking resemblance to BRCA1-deficient mammary epithelium [14, 15, 60]. Of note, it was reported that BRCA1 and GATA3 physically interact with each other to regulate gene expression . Therefore, it is conceivable that BRCA1 promotes luminal differentiation by facilitating GATA3 transcriptional activity at the corresponding super-enhancers. We surmise that in breast epithelium of BRCA1 mutation carriers, BRCA1 haploinsufficiency could dampen GATA3 action in promoting luminal differentiation, which in turn drives the luminal-to-basal transition observed at early stages of BRCA1-associated breast tumorigenesis. BRD4, a member of the bromodomain and extraterminal (BET) family, is a reader of acetylated histones [69, 70, 71]. BRD4 regulates transcription through its interaction with the Mediator complex and positive transcription elongation factor b (P-TEFb) [81, 82, 83, 84]. Genome-wide study found that BRD4 co-localizes with H3K27ac [46, 85], and its binding with acetylated histones is important for maintenance of higher-order chromatin structure . Of note, super-enhancers are occupied by 16-fold more BRD4 than typical enhancers, and super-enhancer functions are preferentially affected by BRD4 inhibition . On the other hand, CTCF binds to DNA in a methylation-sensitive manner [87, 88] and is primarily responsible for setting the boundaries of neighboring chromatin domains. Targeted degradation of CTCF leads to disruption of chromatin loops . 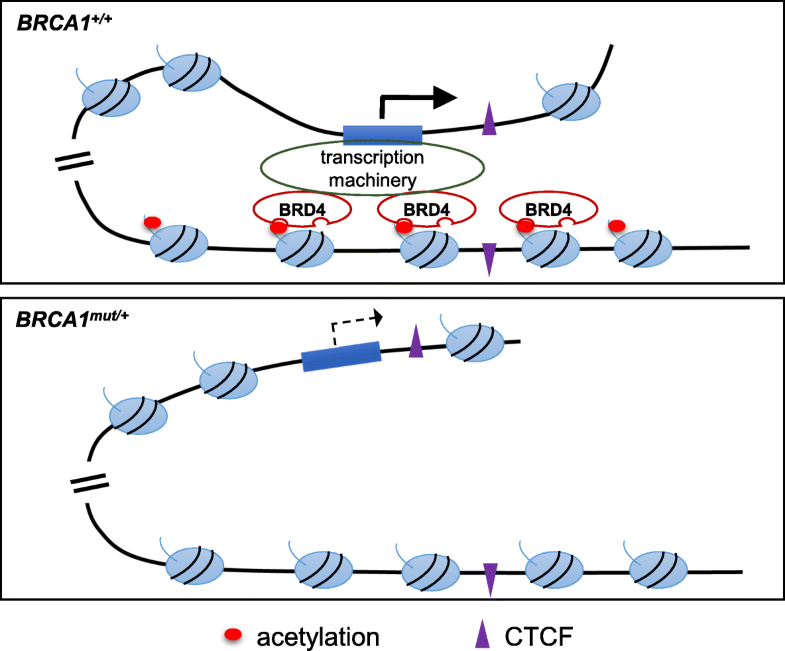 Our data clearly show that BRCA1 haploinsufficiency (BRCA1mut/+) significantly weakens BRD4 chromatin binding and enhancer-promoter looping while keeping CTCF chromatin binding intact. This places BRCA1 action between CTCF and BRD4 in chromatin looping at the loci examined in our study. We propose a model whereby reduced H3K27ac in BRCA1 haploinsufficient cells leads to decreased BRD4 recruitment, which in turn causes attenuated super-enhancer functions (Fig. 7). A role of BRCA1 in regulation of chromatin architecture is consistent with our earlier finding that, upon being tethered to chromatin, BRCA1 is capable of unfolding high-order chromatin structure . While the biochemical basis for BRCA1 function in enhancer-promoter looping remains to be elucidated, several possible mechanisms are worth considering. First, BRCA1 could reinforce enhancer-promoter looping by recruiting HATs such as p300 and thus increasing H3K27ac density . In a second scenario, BRCA1 is known to interact with RNA polymerase II (Pol II) and Pol II-pausing factor NELF-B/COBRA1 [33, 34]. In addition, BRD4 participates in regulation of transcription elongation [82, 83, 84]. In this regard, BRCA1 could strengthen enhancer-promoter looping through its interactions with factors involved in regulation of Pol II dynamics at the promoter-proximal region. In yet another alternative model, the potent ubiquitin E3 ligase activity of BRCA1/BARD1 heterodimeric complex has recently been implicated in histone H2A ubiquitination  and estrogen metabolism-related transcriptional regulation . It is therefore conceivable that BRCA1/BARD1 E3 ligase-mediated chromatin modification could impact enhancer-promoter looping . These possible mechanisms are not mutually exclusive, and further studies are warranted to shed more mechanistic light on three-dimensional chromatin reorganization in BRCA1 mutation-carrying breast epithelium. Our gene ontology analyses indicate that genes proximal to BRCA1-associated super-enhancers are enriched with those involved in cellular responses to various physiological cues including inflammation and stress. In particular, those involved in NF-κB and retinoic acid responses were identified in a previous study by Gardini et al. using an in vitro BRCA1 knock-down system in MCF10A cells . Moreover, deregulated progesterone signaling [93, 94] and persistently active NF-κB pathway  were found in BRCA1-deficient mammary glands. However, because transcriptional enhancers do not always regulate expression of the most proximal genes, the functional link between BRCA1-affected super-enhancers and their neighboring genes used in our gene ontology analyses need to be experimentally validated. We are also cognizant of the limitation in using the immortalized cell line MCF10A to investigate BRCA1-regulated chromatin events and transcription, which obviously differs from primary breast epithelial cells in vivo. However, the fact that BRCA1 haploinsufficiency displays a similar effect on the selected super-enhancers in clinical samples and MCF10A cells justifies the use of the cell line model for the in-depth mechanistic studies. Moreover, previously published findings using the same MCF10A-based cell culture model have provided physiologically relevant information concerning BRCA1 functions in regulation of epithelial differentiation and maintenance of genome stability [29, 30, 96, 97]. Given the various degrees of functional deficiency of BRCA1 mutations in supporting super-enhancer activity, the in vitro system established in our study could serve as a convenient way of further exploring phenotype-genotype correlation for cancer-predisposing BRCA1 mutations. How germ-line BRCA1 haploinsufficiency preferentially leads to tissue-specific cancer development remains a longstanding conundrum. Using haploinsufficient HMECs and cell line models, work from several laboratories supports the notion that genomic instability due to compromised BRCA1 activity in replication stress resolution and/or DNA repair contributes to BRCA1-associated tumorigenesis [27, 28, 29, 30, 31, 98]. Of note, Sedic et al. has shown that BRCA1 haploinsufficiency-induced genomic instability occurs specifically in HMECs but not breast fibroblasts , which provides a molecular explanation for tissue-specificity of BRCA1-associated tumorigenesis. However, given the ubiquitous nature of DNA replication stress and DSB DNA repair, it is not clear whether genomic instability alone is sufficient to account for luminal-to-basal transition and subsequent cancer development in BRCA1 mutation carriers. In this regard, mounting evidence suggests that BRCA1-mediated transcriptional regulation plays previously under-appreciated roles in tissue-specific tumor suppression. 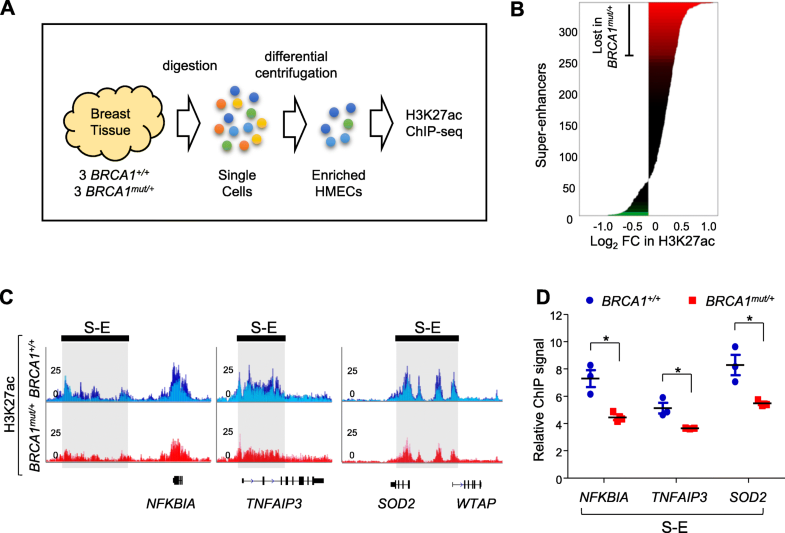 For example, the alternative NF-κB pathway is constitutively and preferentially active in BRCA1-deficient mammary luminal progenitor cells , the cell of origin for BRCA1-associated tumors. Furthermore, we recently showed that R-loops, transcription byproducts and DNA-RNA hybrids involved in genomic instability, preferentially accumulate in luminal epithelial cells but not in basal or stromal cells of BRCA1 mutation-carrying breast tissue . Our current study provides a compelling molecular link between BRCA1 haploinsufficiency and deficiency in super-enhancer functions and chromatin looping at a very early stage of BRCA1 mutation-associated breast tumorigenesis. Conceptually, our findings strongly suggest that a direct role of BRCA1 in chromatin reorganization and transcriptional regulation contributes to its tissue-specific tumor suppressor function. A better understanding of the early molecular abnormalities in BRCA1 mutation-carrying breast epithelium could potentially inform development of novel tools to more precisely prevent breast tumors in women with germ-line BRCA1 mutations. We thank Chi Zhang, Xiayan Zhao, Jerry Chen, Jingwei Li, Fei Ge and Sabrina Smith for technical assistance. The work was supported by grants to RL from NIH (CA220578); to YH from NIH (CA212674), DOD (W81XWH-17-1-0007); to VXJ from NIH (GM114142, U54CA217297); to CL and RL from NIH (CA214176), and the Cancer Prevention and Research Institute of Texas (CPRIT, RP170126); and to H-CC from an NIH Postdoctoral Training Grant (T32CA148724). ChIP-seq data was generated in the Genome Sequencing Facility, which is supported by NIH-NCI P30 CA054174 (Cancer Center at UT Health San Antonio), NIH Shared Instrument grant 1S10OD021805-01 (S10 grant), and CPRIT Core Facility Award (RP160732). Sequence data that support the findings of this study have been deposited in NIH Gene Expression Omnibus (GEO) with the accession codes GSE121229. All other remaining data are available within the article, or from the authors upon request. RL, YH, and VXJ conceived and supervised the project. RL, YH, VXJ, and XZ designed the experiments. XZ, H-CC, and Y-PH performed the experiments. XZ, YW, CL, BHP, VXJ, YH, and RL analyzed the data. XZ and RL wrote the manuscript. All authors read and approved the final manuscript. The study was approved by Institutional Review Board at the University of Texas Health Science Center at San Antonio with reference number HSC20080058H. All donors signed written consent forms authorizing the use of the specimens.